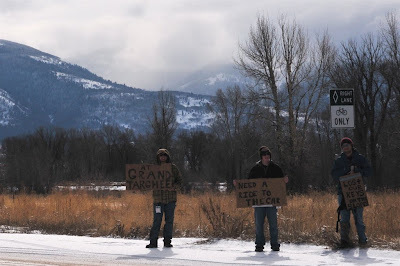 These clowns were rather crafty with their sign work and I couldn't help but increase my hitchhiking karma. I was headed their way and picked them up just outside of Jackson. Always bring an extra key to the mountain. Lesson learned. 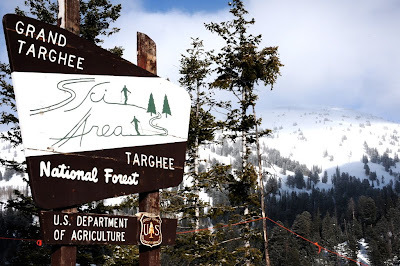 The Grand Targhee Ski Area sits just a few miles from Jackson Hole as the crow flies, but requires a visit to Idaho before turning up Ski Hill Road in Driggs. Crossing back into Wyoming, you will find Grand Targhee, sitting in a vague world known as Wydaho. There was actually a bit of fresh snow (first I'd seen in a while) and the coverage was good throughout the mountain, particularly on north-facing aspects. The three full-length lifts at Grand Targhee cover enough area to keep skiers entertained all day long, and the lift lines... well, there are no lift lines.